Paris, 14 March 2014 — On Tuesday, 18 March at 10 a.m., the “Industry” (ITRE) committee of the European Parliament will take a crucial decision for the future of Net Neutrality in Europe. The adoption of the report could mark a point of no return. Two conflicting visions for the future of the Internet oppose the two largest political groups in the EU Parliament, the social democratic party (S&D) and the conservative party (EPP). The outcome of the vote might be decided by the MEPs of the liberal group (ALDE) who appear not to have chosen which vision they will support, although their rapporteur, Jens Rohde, is pushing for the adoption of anti-Net Neutrality provisions. If adopted, these provisions would end the Internet as we know it, harming the freedom of communication and innovation. The ITRE committee had been scheduled to finally adopt the Neelie Kroes’ proposal on the European Single Market for Electronic Communications on 24 February. But because of the unavailability of the 22 linguistic versions of the amendments to be voted, the members of the ITRE committee decided to postpone the decision after one and a half hours of agitated discussion. Before that date, the work in shadow meetings had been intense, as the chapter addressing the open Internet divided political groups. The proposal of Pilar del Castillo Vera (ES – EPP), the ITRE rapporteur on this dossier, distorts the principle of Net Neutrality to please the telecom lobby. Her compromise amendments (pdf commented by LQDN) bypass Net Neutrality by allowing telecom operators to make deals with Internet services (e.g. YouTube or Netflix) to grant them priorised delivery through so-called “specialised services”. Unfortunately her proposals are supported by her group, as a whole, even if EPP members in the “Civil Liberties” (LIBE) committee broadly supported the provisions defending Net Neutrality. MEP Catherine Trautmann (FR – S&D), shadow rapporteur for her group, has now taken a firm position in defense of innovation and competition in the digital economy. Mrs Trautmann has proposed another version of the same compromise amendment but which now states clearly that “specialised services” cannot be used by big telecom operators in partnership with Internet giants to circumvent Net Neutrality and thus dominate the Internet and the wider digital economy (see a comparison table on the two amendments). At this stage, the battle for an open Internet is far from won. The members of the liberal group1Jens ROHDE (Denmark), Adina-Ioana VĂLEAN (Romania), Jürgen CREUTZMANN (Germany), Brian CROWLEY (Ireland), Fiona HALL (United Kingdom), Kent JOHANSSON (Sweden). (ALDE) – whose orientation will be key in determining the outcome of the vote – have so far refused to side with the Socio-Democrats and the Greens, supporting instead the dangerous approach of rapporteur Del Castillo. It is important that European citizens urge all ITRE MEPs, especially those in the ALDE group, to protect the public interest by adopting Trautmann’s compromise amendment on “Open Internet” rather than Del Castillo’s. “In the upcoming vote of the ‘Industry’ committee, the Parliament must seize the opportunity to defend the Internet against telecom operators and US Internet giants. The provisions proposed by both EU commissioner Neelie Kroes and the Parliament’s rapporteur Pilar del Castillo Vera contain huge loopholes posing a real threat to Net Neutrality, competition and freedom of choice for Internet users. They must be rejected. In the context of approaching European elections, citizens need to hold their representatives accountable and ensure that the Internet as we know it is protected from the short-sighted business interests of dominant corporations.” concludes Félix Tréguer, cofounder of the association La Quadrature du Net. Every European citizen can act to influence the evolution of Net Neutrality by calling on their MEPs to establish solid protections of the free Internet. 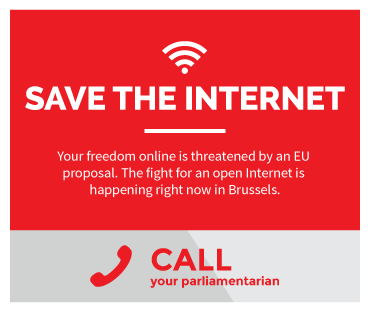 To get on board, please visit the campaign website savetheinternet.eu. 1. ↑ Jens ROHDE (Denmark), Adina-Ioana VĂLEAN (Romania), Jürgen CREUTZMANN (Germany), Brian CROWLEY (Ireland), Fiona HALL (United Kingdom), Kent JOHANSSON (Sweden).